How can I Use HERBS in my Daily Life? 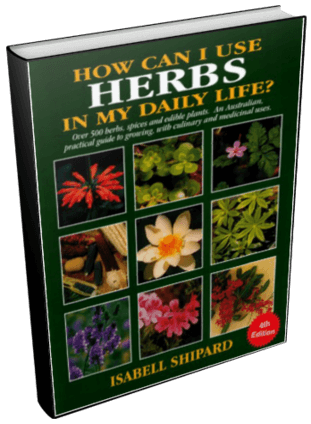 is a popular, best-selling, comprehensive herb book. A practical guide to growing and using culinary and medicinal herbs, natural herbal remedies, alternative herbal medicines, natural herbal pain relief and herbal nutrition. There are few books that are ‘must have’s’ in a home library, but this is definitely one of them. This Australian herb book (now in 6th Edition) is a reference that covers over 500 herbs, spices and edible plants. [380+ A4 pages, 230+ colour photos and 58 black and white photos]. This is a best-selling, comprehensive reference book on how to use over 500 culinary and medicinal herbs. A practical guide to growing, natural herbal remedies, alternative herbal medicines, natural herbal pain relief and herbal nutrition. There are few books that are ‘must have’s’ in a home library, but this is definitely one of them. A herb ‘bible’ that will rarely stay on the shelf. 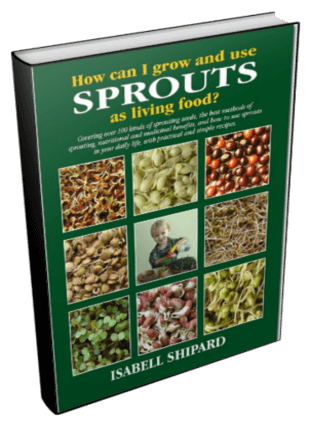 By respected Australian herbalist and author, Isabell Shipard. How can I Use HERBS in my Daily Life? will be beneficial for everyone interested in natural health and how to make the best of their garden. 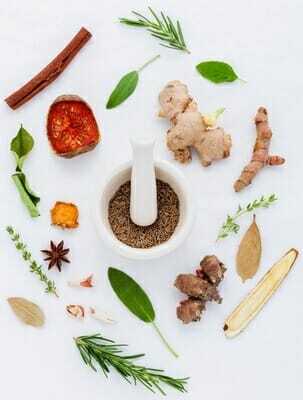 how you can use herbs for alternative medicine, herbal remedies, herbal nutrition, alternative pain relief. Through reading this herb book, you will learn to use herbs that are rich in antioxidants, vitamins, minerals, chlorophyll and natural antibiotics, and how many herbs have valuable alkalising benefits. 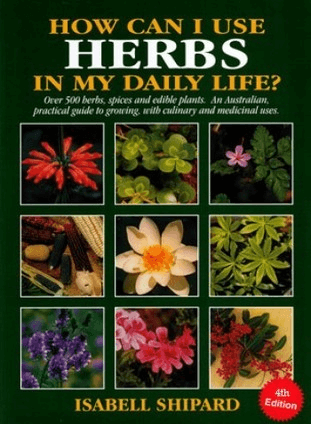 This Australian herb book (now in 6th Edition) covers over 500 herbs, spices and edible plants. Full colour, soft celloglazed cover, durable sewn bound spine. Over 380 A4 pages with over 230 colour photos and 58 black and white photos. 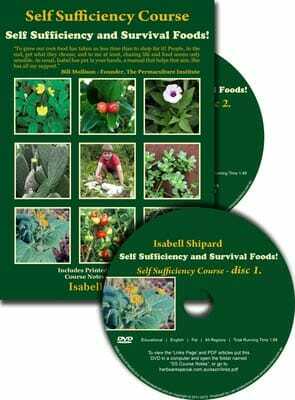 The following video from Isabell’s Wonderful World of Herbs Course on DVD shares insight into just a fragment of what you will learn from this practical herb ‘bible’. 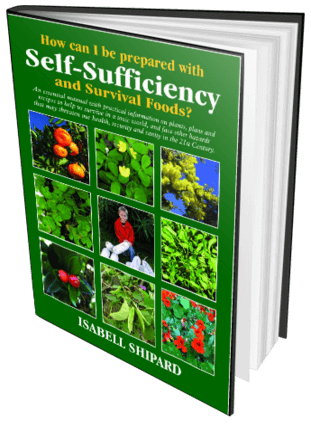 “Isabell has put her extensive knowledge to good use in what is possibly the most comprehensive herb book in existence.” – Grassroots Magazine, Oct/Nov 2003, Australia’s most popular self-sufficiency magazine. “This is the ultimate book on plants, detailing the valuable role they play in our daily lives, from providing food to healing our bodies. The user-friendly index, the conveniently located technical glossary, and the comprehensive plant information are truly superb, along with outstanding photographs, nothing has been missed. When I thumbed through it, I gasped, ‘This will see me through to the end of my days.’ It’s the most useful book on plants I have ever purchased. 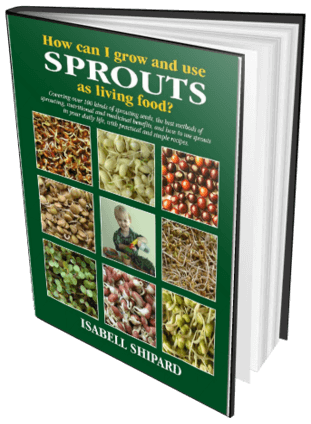 At last, Isabell’s extensive knowledge is now available for us all to read.” – Jane Many Leaves Lawrance, Diploma in Permaculture, Seed Saver and Edible Plant Collector, North QLD. “Isabell Shipard’s book is enthralling, and well worth a read. 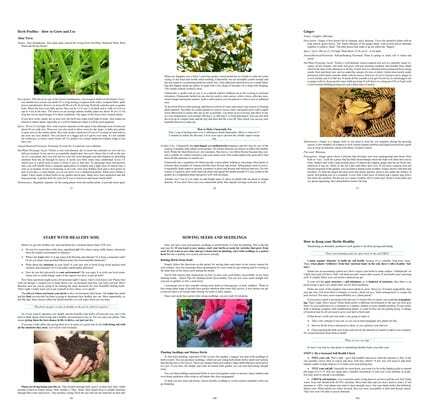 It offers a wealth of information for the herb gardener. I found it exciting and inspiring, but most of all, hard to put down once I started reading. Well done and thank you for a fabulous book.” – Daphne Murphy, Sunnybank Hill, QLD. “This book totally replaces all the other books I have on herbs. The amount of information on each herb is amazing. Not only will this be an invaluable tool in the creation of my herb garden and in the health and well-being of my family, but also for my animals who suffer just as much from the processed foods and pollution of today.” – Sharon Falls, Erica, VIC. “Everybody should have this impressive herb book in their home. It is practical and very informative. I had no idea that so many herbs could help humans and animals. So much fun to cook with and most importantly to keep you fit and well. Thankyou Isabell for sharing your knowledge with us all.” – Patsy Green, Sunshine Coast, QLD. “Having had little interest in reading books most of my life, I have been amazed at my addiction to Isabell’s herbal masterpiece. The incredible abundance of information is a cumulation of ancient and modern knowledge, folklore, and more than impressive case histories. The book offers easy reference, and information and good sound practical healing and prevention of disease. It has created an excitement in me, inspiring me to be more responsible for my own health. I recommend it to anyone interested in their own wellbeing.” – Gordon Halliday, Crystal Waters, QLD. “A wonderful informative book of growing and using herbs. Anyone interested in gardening, herbs and good health will love this book, even good tips for flower arrangers and craft workers. An enjoyable book to read, easy to understand, every time you pick it up you learn something new. I am purchasing another book for my daughter.” – Mary Griffin, Biggenden, QLD. 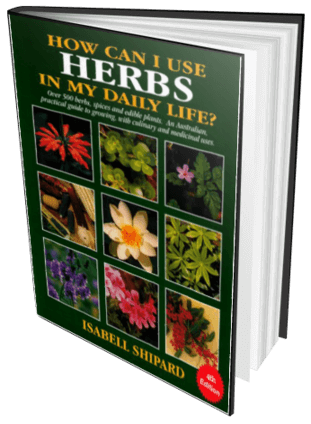 “Isabell’s Herb Book is a treasure trove of practical information, and I highly recommend that it be in every library, in fact in every home.” – Rod Bailey, Melbourne, VIC. “It is so important to understand why we have so many herbs that can cover such a variety of uses. Just think what a better place we would live in if we didn’t have to take pharmaceutical medicine for every ailment we suffer; and if we didn’t have to use chemical pesticides for every insect that was causing havoc in our garden. The book ‘How can I use Herbs in my daily life?’ covers all aspects of herb growing, identifying, culinary and medicinal uses. I recommend the book to everyone I talk to. Also, the book has opened my eyes to the number of herbs that we actually call weeds, which grow wild everywhere, that can be used for so many everyday uses.” – Sally Rogers, Baan Baa, NSW. 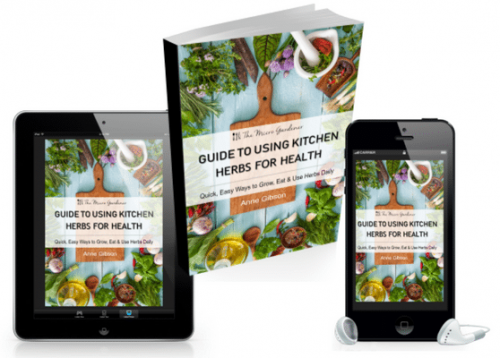 “This herb book is one of the best I have ever read. It not only tells you how to identify the herbs and grow them; it also tells how to use them and how they might benefit your health. I can’t put it down. We have waited a long time for a book like this. I have been telling all my friends about this book and they are as happy as I am.” – Val Butler, Rosewood, QLD. “As a long time volunteer with Seed Savers I work on cataloguing material for our library. Isabell’s herb book is a fascinating, colourful and a well researched reference on growing and using herbs, their lore and health-giving properties, both medicinal and culinary. As well as the clearly arranged need-to-know details, there is a wealth of amusing folklore, anecdotal true-life stories of health benefits; historical and scientific snippets; and practical ways of using herbs, even how to dry and press their flowers. All this in a simple down-to-earth style, and beautiful colour photos. Put it on the coffee table to both use, enjoy, and introduce others to the life-enhancing world of herbs.” – Paula Williams, Seeds Savers, Byron Bay, NSW. “A unique book that deserves a special place, in every home. This book, is Isabell’s most proud achievement. 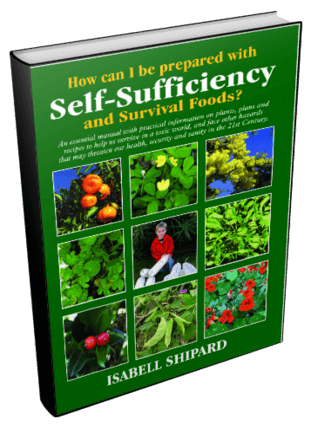 Since receiving the book, my quest to become more self-sufficient has been realised.” – Bill Goodwin, Queensland.